UC Berkeley researchers have created highly sensitive tactile sensors for robotic applications; a new technique developed by MIT researchers allows tiny sensors to monitor small changes in magnetic fields, such as when neurons transmit electrical signals. From the world of nanotechnology, researchers with Berkeley Lab and UC Berkeley are on the verge of electronic whiskers — tactile sensors from composite films of carbon nanotubes and silver nanoparticles similar to the highly sensitive whiskers of cats and rats. These new e-whiskers respond to pressure as slight as a single Pascal, which is about the amount of pressure exerted on a table surface by a dollar bill. These whiskers could give robots new abilities to “see” and “feel” their surrounding environment. The electronic whiskers consist of high-aspect-ratio elastic fibers coated with conductive composite films of nanotubes and nanoparticles. In tests, these whiskers were 10 times more sensitive to pressure than all previously reported capacitive or resistive pressure sensors, the researchers said. 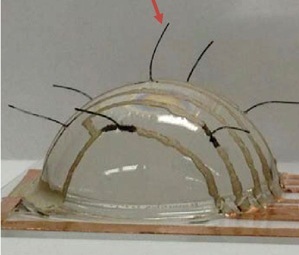 To make the e-whiskers, the researchers used a carbon nanotube paste to form an electrically conductive network matrix with excellent bendability. To this carbon nanotube matrix they loaded a thin film of silver nanoparticles that endowed the matrix with high sensitivity to mechanical strain. The strain sensitivity and electrical resistivity of the composite film is readily tuned by changing the composition ratio of the carbon nanotubes and the silver nanoparticles. The composite can then be painted or printed onto high-aspect-ratio elastic fibers to form e-whiskers that can be integrated with different user-interactive systems. These e-whiskers represent a new type of highly responsive tactile sensor networks for real time monitoring of environmental effects and given their ease of fabrication, light weight and excellent performance, the e-whiskers should have a wide range of applications for advanced robotics, human-machine user interfaces, and biological applications. Thanks to a new sensing technique developed at MIT, diamonds may help us to understand how the brain processes information. A team in MIT’s Quantum Engineering Group has developed a new method to control nanoscale diamond sensors, which are capable of measuring even very weak magnetic fields. In 2008, researchers from MIT, Harvard University and other institutions first revealed that nanoscale defects inside diamonds could be used as magnetic sensors. The defects are naturally occurring, and are known as nitrogen-vacancy (N-V) centers. They are sensitive to external magnetic fields, much like compasses. Defects inside diamonds are also known as color centers since they give the gemstones a particular hue. The N-V center defect consists of a nitrogen atom in place of a carbon atom and next to a vacancy — or hollow — within the diamond’s lattice structure. Many such defects within a diamond would give the gemstone a pink color, and when illuminated with light they emit a red light. To develop the new method of controlling these sensors, the researchers first probed the diamond with green laser light until they detected a red light being emitted, which told them exactly where the defect was located. They then applied a microwave field to the nanoscale sensor, to manipulate the electron spin of the N-V center to alter the intensity of light emitted by the defect, to a degree that depends not only on the microwave field but also on any external magnetic fields present. To measure external magnetic fields and how they change over time, the researchers targeted the nanoscale sensor with a microwave pulse, which switched the direction of the N-V center’s electron spin. They applied a different series of these pulses which acted as filters — each of which switched the direction of the electron spin a different number of times. As such, the team was able to efficiently collect information about the external magnetic field. They then applied signal-processing techniques to interpret this information and used it to reconstruct the entire magnetic field.